Los Angeles-based exec Evyen Klean has been one of the top music supervisors for film & TV for more than 20 years. He has been a music supervisor and music consultant for HBO for over 18 years in addition to working on a multitude of both independent and studio features, as well as network television series and soundtracks. He is also the owner of Neophonic, Inc., a leading music supervision company. Klean has won an Emmy award for Music Mixing on the HBO film, Bessie. In addition, he’s a five-time Guild of Music Supervisors award winner, including four “Music Supervisor of the Year” honors, as well as a five-time Hollywood Music in Media (HMMA) Award nominee. Klean founded Neophonic in 1980 and was involved in the areas of artist management, music publishing, record labels, and recording studios, where he developed a reputation for his extensive musical knowledge, experience, and strong relationships in the entertainment community. 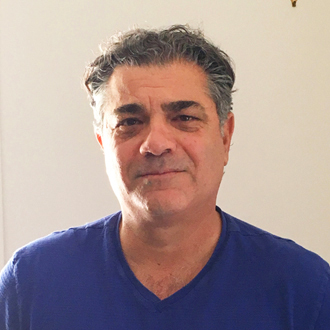 Eventually shifting the company’s focus to music supervision, Klean has since supervised and consulted for over 100 films and over 1,500 hours of television. Evyen is currently a music supervisor on the highly popular, award-winning TV series, Game Of Thrones. He also works on the Cinemax TV series The Knick, and the new Cinemax series Quarry. In addition, he’s working on the new HBO films Confirmation (starring Kerry Washington), All The Way (starring Bryan Cranston) and The Wizard of Lies (starring Robert DeNiro). Other recent credits include the comedy series Veep (starring Julia Louis-Dreyfuss), the series Mad Dogs for Amazon, The Brink and True Detective for HBO as well as Emmy award-winning films Bessie (starring Queen Latifah) and Behind the Candelabra (starring Michael Douglas & Matt Damon). Interestingly, Klean also serves as a music consultant on the new HBO series Vinyl, which is produced by Martin Scorsese & Mick Jagger. This highly anticipated series stars Bobby Cannavale and Olivia Wilde and spotlights the music business in the 1970s. Vinyl literally features hundreds of songs and is a major project for music supervisor Randall Poster, Klean and his Neophonic team. We are pleased to do this new Q&A interview with Evyen Klean. He tells us how he got started in the music business and how he built his company, Neophonic. Towards the end of the interview, Klean also offers insights and tips on how songwriters, artists & bands can pitch their music to films & TV shows for sync placements. Klean: I’m from Los Angeles—I grew up in the Redondo Beach/Torrance area. I’ve been around music pretty much my whole life. My older brother was in a band—I think the first incarnation of his band was called the Hubcaps—and I would hang out with them during rehearsals when they recorded. I first played in a band in the third grade. My friends dragged me into the garage and taught me the chords to a Kinks song. I played rhythm guitar, and it’s been pretty much about the rock & roll ever since. I also played saxophone when I was a little older. After high school, I went off to college at Humboldt State University where I played soccer, majored in business and minored in music. Later on, I enrolled in the Recording Arts & Sciences professional designation program at UCLA where I took some music producing, record company negotiation, and copyright classes. It was also around that time that my brother Zamp Nicall and I formed Neophonic Records, which was the first incarnation of Neophonic. 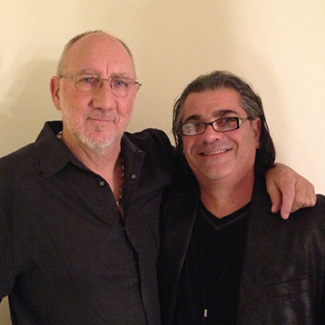 Evyen Klean (right) with Pete Townshend of The Who. DK: How did you come up with the name, Neophonic? Then in the late ’80s, Karl Schaefer, my roommate at the time, came home one day and said, “I just sold a script! You have to help me with the music.” That was about 1988 and the script was called TV 101 and the Grant Tinker-Gannett Company bought it. [Soon after] I started working on the pilot and we hired Stewart Copeland (drummer for The Police) to be the composer, and we put a band that was blowing up called U2 in it. The pilot was picked up to series, and that was the beginning of the shift for me and Neophonic into music supervision. It was also during this period that I met (music exec, musician, engineer and studio manager) Paul Broucek. We were doing TV 101 and I think Paul was at Fairlight at the time. We ended up becoming partners for about a decade. Paul is now the President of Warner Bros. Film Music. Paul and I began working on TV 101 and other shows and formed Klean/Broucek Music, although I also kept Neophonic. That went on for about 10 years until Paul took an opportunity to go and work for New Line Pictures. DK: When you were working with Paul Broucek, what were some of the TV shows and films that you worked on? Klean: The most notable project would be the TV series, Baywatch, which was produced by Grant Tinker-Gannett, who was also producing TV 101. Enjoyed working on Red Rock West and W.T.F. and over the years we worked on dozens of TV shows and films. I think we had the most fun together when we were producing music in the studio or working on set. DK: You’ve had a great relationship with HBO. How did it get started? It started as a six-month consultancy, which turned into a year and then into multiple years, and here we are 20 years later. It’s morphed and changed a bit, as HBO has changed and grown and increased their output and production on the series side. It’s been incredibly rewarding for me, and it’s afforded me lots of opportunities to work with directors and producers and composers and artists. I think at the same time, we’ve also brought all of our experience and skill sets to help create a music philosophy for HBO, and have sort of become their de facto music department. DK: In the early years of your relationship with HBO, what were some of the main projects you worked on? On the set of the HBO film, Behind The Candelabra. Pictured in the foreground (l-r): Evyen Klean, Michael Douglas and Randy Kerber (pianist). Klean: I didn’t initially work on their series—I went to work on their films and mini-series. The Rat Pack, Lackawanna Blues, Angels In America are a few. DK: Later on you worked on one of my all-time favorite mini-series, John Adams. Klean: Yes, HBO has a history of doing incredible mini-series like John Adams and I’m fortunate to have worked on many of them. JA was a really well done production and the 7-part mini took a lot of hard work over a long period of time. DK: At Neophonic, you’re both a music supervisor and a music consultant. Can you please explain the differences between these two positions? Klean: As a music consultant for HBO, I’m not always supervising the project. At the beginning of a project we will look and try to figure out it’s musical needs. There are instances that I can apply myself or someone at Neophonic as a music supervisor, and that’s my/our job title for that particular production. There are other situations we feel we aren’t the best scenario for the project, so we consult and help put together an appropriate plan: Maybe we need to bring in a music supervisor for a project that’s happening out of New York, or the director has someone they like to work with and in those instances we assist in evaluating candidates, set up meetings if necessary and help facilitate a music supervisor. Sometimes we may also be thinking putting together a soundtrack for a particular project so I might be the liaison between HBO and the various labels and filmmakers/showrunners. There are other situations where a project doesn’t need a music supervisor, but needs a composer, so I might provide composer choices and sit down with the filmmakers, to help them get to the other side of that process all the way through making the deal for the composer. We’ve come up with some general music policies. We’ll put together different multiple use deals with different labels and publishers. HBO Legal or HBO Production can call me and say, “We’re thinking about doing this on this particular show, and what are the pitfalls and are the songs surrounding this story clearable?” We regularly get scripts or series of scripts and be asked to read them and come up with a music budget for them so they can budget the film music accordingly. Those are the consulting type of things. Obviously, if it makes sense for me to be the music supervisor, I would do that. The barometer I use is, “What’s best for the production?” If I wear the production/music supervisor hat, it’s a different process for us as a company than it would be if I’m wearing the consulting hat, which is kind of like wearing the studio hat. 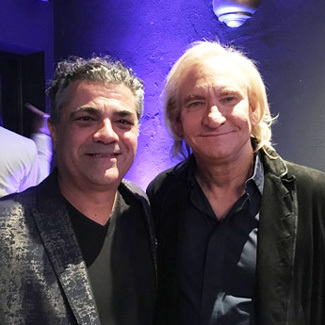 Evyen Klean with Joe Walsh. DK: As the music consultant or supervisor, do you often select which composer will be doing the score? Klean: Yes. For HBO I’m absolutely a part of that process. I believe I make the majority of the composer deals for their movies and mini-series, and for some of their series. Of course, this sometimes depends how involved we are in a particular series. I’ve worked with many different composers over the years and try to help whenever the producers and directors need it. I’ll find a good match for the project depending on the music needs and the personalities involved. I liken it to casting—if we do our job the right way and cast the right composer with the project and director, then I’ve done a big part of my job as it pertains to the score. There are however many instances that I’m part of the score process in reviewing cues with the filmmakers and sometimes assist in producing the score. It just depends on the relationship I have with filmmakers and/or the composer. DK: Currently, one of the great shows on HBO is Game Of Thrones. Are you a supervisor or consultant for Game Of Thrones? Klean: I supervise on Game Of Thrones. It started when they had shot the pilot and had hired a composer that didn’t work out. I got a call from HBO… “Can you go meet with Dan (Weiss) and Dave (Benioff), the showrunners, and talk about composers and music for their series? Maybe you can help them find a composer.” So I went in and watched the pilot and sat down with them a few days later. I pitched the idea that they needed someone like Ramin Djawadi, who at the time they weren’t familiar with. They quickly looked him up and listened to some of his music and very much liked the idea of it. I then brought Ramin in for a meeting. Everyone felt that it was a great fit although Ramin initially had reservations because he had a couple of projects going on that overlapped and he wanted to be careful that he could deliver to all the projects he had committed to. It took several conversations with me convincing him that the project was really good with an amazing group of people involved, and that we as a production (the Game of Thrones team) had his back and that we understood his situation. He eventually said yes, and I think all parties are extremely happy and grateful that they’re all working together. As a matter of fact, I was just at a Game Of Thrones Season Six spotting session where we were listening to cues and spotting music for a new episode. DK: I’m excited about the upcoming HBO series, Vinyl, about the 1970s music business. Klean: Yes, it’s being produced by Martin Scorsese and Mick Jagger (along with a number of other incredibly talented producers). Randy Poster and Meghan Currier are the music supervisors on the project and it is incredibly music intensive. Neophonic is consulting on the show. We do all of the music clearances in addition to working on putting together the soundtrack deal and helping with artist deals. It is chock full of songs with dozens of on Camera Performances and new recordings (re-recordings of period songs). DK: So it sounds like quite a job, just in the clearance part of it. Klean: Yes I think Jennifer Reeve, who’s doing the clearances here at Neophonic, has cleared over 700 songs for 10 episodes. DK: What are some of the films and TV shows, that you’ve worked on for HBO or for other companies that that you’re most proud of? Klean: I would have to start by saying the music intensive projects, Bessie, Behind the Candelabra, Rat Pack, Lackawanna Blues. I have been doing this for a long time and there are quite a few projects, films and series that I am proud of. I love working on Game Of Thrones. Currently, we’re doing Veep and a new show called Quarry and consulting on West World and Crime. We’re also in the midst of a handful of new movies—one about President Lyndon Johnson (All The Way), one about Clarence Thomas & Anita Hill (Confirmation) and one about Bernie Madoff (Wizard of Lies). When I think about it, I’ve worked on over a 100 films, and I would guess that over half are HBO films. DK: I read that you won an Emmy award for Bessie. Is that correct? Klean: Yes, that’s correct. The category was for Music Mixing. I produced all the music for Bessie with a good friend of mine, Ed Cherney. Ed has produced or engineered everybody from the Rolling Stones to Bonnie Raitt. So we were joined at the hip throughout this process. I also worked with (producer & engineer) Stewart Lerman out of New York, recording a bunch of music for the project. DK: At Neophonic how big is your team—how many people work there? Klean: We currently have seven people working at Neophonic: four music supervisors, a music coordinator, and support staff. PJ Bloom is my partner-in-crime here at Neophonic. The other music supervisors are Jennifer Reeve and Janet Lopez, and Amanda Krieg-Thomas is the newest creative addition to the team. DK: What is your favorite part about doing music supervision? Klean: My favorite part of music supervision is when I’m working on something that’s music-intensive. For me, music-intensive is when we have a lot of music integrated into the storytelling or integrated on camera. It’s when we’re putting together music, going into the studio producing music, being on set with multiple bands, and working with the director and the different department heads to make the music work for the film and storytelling during pre-production, production and post. Working in the studio with artists like B.B. King, Little Richard, Mos Def and producing the music for a particular project—those are the most rewarding moments for me. I’ve been doing this for a really long time and finding that background use in a restaurant doesn’t have that same juice that it did 20 years ago. Getting into the studio and working with great musicians and artists and singers and making music, and to have that realized on camera—that certainly still carries that juice for me. On the set of the Cinemax series Quarry: PJ Bloom of Neophonic (second from left), Janet Lopez of Neophonic (third from left), and Evyen Klean (far right). DK: These days in the music business, many songwriters and artists are trying to place their songs in films & TV shows, to earn sync income. What advice would you give to these writers, artists & bands, on how to pitch their music? Klean: I’ll start by saying this: Neophonic has been in business doing music supervision for a very long time. Over the years—myself, PJ and everyone here—has cultivated a lot of different relationships with many different music suppliers. 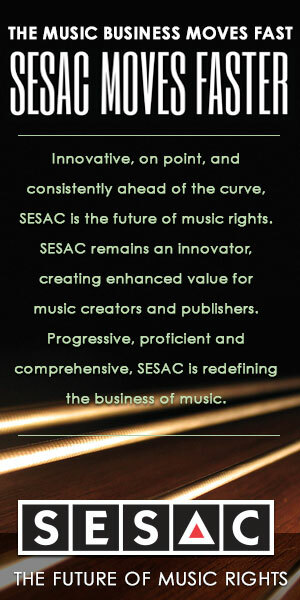 [This is certainly the case] on the major label level and major publisher level, but also on the independent label level and smaller publishers, band managers and music brokers per se—music providers like Ocean Park and others that represent multiple labels and multiple artists for film and television without being a record label or owning the product. Just functioning as a music house that helps market music and particular acts and genres for film and television. So when we’re looking for music, we’re primarily going to our relationships that we’ve formed through another relationship, or through a project where we meet new people and they become part of our musical database. It’s hard to actually entertain the idea of unsolicited music. If we responded to everybody who wanted to send us music, we would never be working; we would just be opening packages and opening emails. It does happen—we do cross paths with people. I get introduced from one artist to another artist, or a manager picked somebody up and wants us to hear something. It usually makes an awful lot of sense to know who you’re pitching to and why you’re pitching. Just randomly trying to get me to put your alt-indie band in a movie I’m working on that happens to take place in 1943 is not really going to get our attention. In other words, you need to do your homework. If you can have someone who pitches music for a living and has relationships—this is a good way to pitch your music to music supervisors. That’s not to say that we don’t find music from new sources—it’s just a really difficult process to be able to pay attention to this many people who are trying to get us music. DK: So if you’re an indie artist or band in the Midwest, and you don’t really know anyone in Hollywood on the film & TV end, is it much better to find a representative, manager, plugger or small publisher to help you? Klean: I would say find someone that has relationships or find someone who has a relationship with us or with a music supplier. I’ve gotten calls from a directors and actors who I’ve worked with previously with, who say “my wife, my husband or son is in a band,” and we take the time to listen because we have a relationship with those people. There are many music suppliers out there from New York to Los Angeles to Nashville that represent talent that sometimes specialize in a genre, so that if we’re working on a film, we might send out a notice to them, saying “we’re looking for this.” This is a void they can fill for us. That’s not to say that we don’t get traction from hearing about or reading about a cool new band that did the homework on their own. It’s just a vetting process that makes life much more efficient for us.